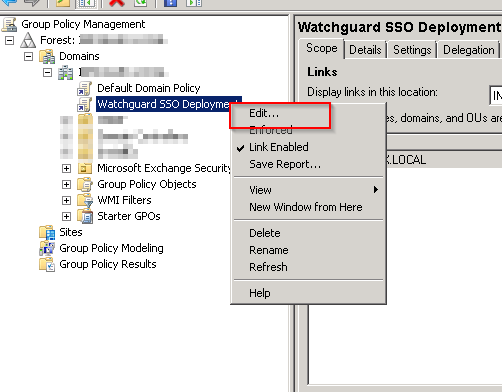 This is the second part in our guide in getting Watchguard Single Sign on working in your active-directory environment. Last time we covered installation of the SSO server agents on your server infrastructure, now we need to push the SSO client out to end users and allow the agent through Windows Firewall in a simple to manage manner. Once the servers have been configured you can add the client to the end users. The servers will pick up most requests anyway, but the SSO client on end user PC is for the more special cases or where your users don’t have a standard configuration. 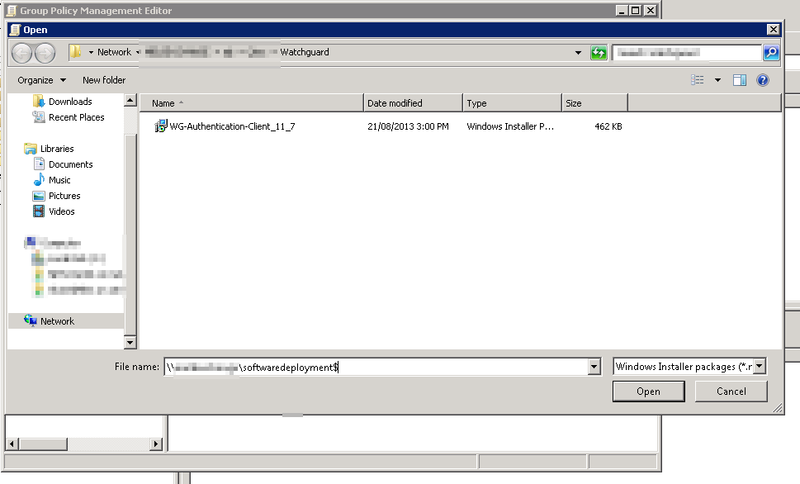 Locate the “WG-Authentication-Client_11_7.msi” file you downloaded earlier. Upload this file to a location on your network that can be accessed by “Authenticated Users”. 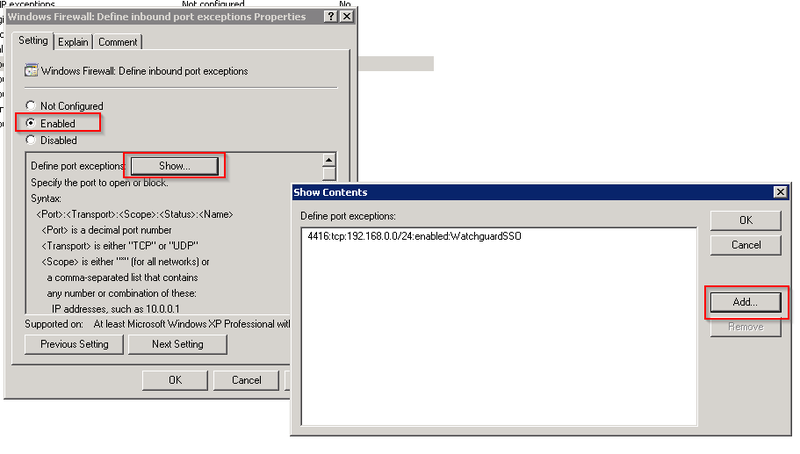 When the GPO is applied on the end users pc, the computer makes the connection to the network share as the computer hostname not the user. 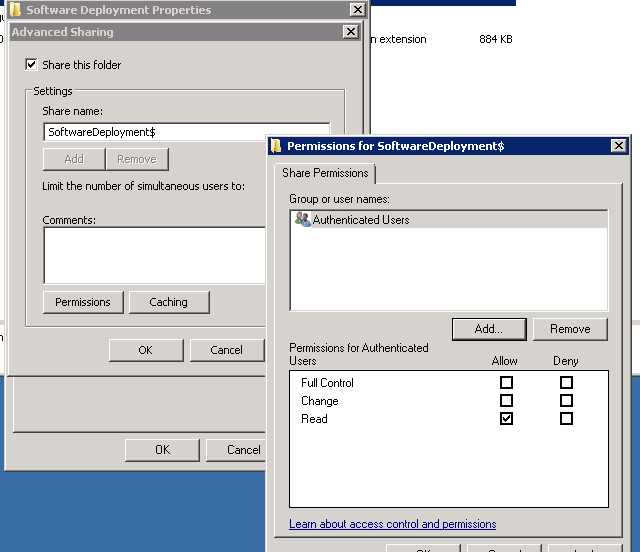 Typically I setup a “SoftwareDeployment” share just for these sorts of things, you can hide it and stop users from installing whatever software by adding a $ to the end of the sharename, dont forget to add “authenticated users” to the share and NTFS permissions for the folder. All the changes should be done under computer configuration so all computers in the domain take the policy, you can prevent certain OU’s from using this policy if required. And browse to the MSI file making sure to use its network share. Keep in mind as mentioned before this network share needs to be accessible from anywhere you want the SSO agent to work from. Multiple site businesses with a single Watchguard for Wan access may consider using a DFS share or similar to speed up installation on boot. 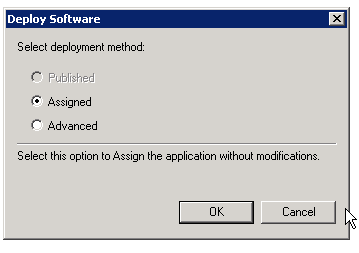 Select the Assigned deployment and click OK and that’s the software deployment configuration complete. Close the rule and the policy editor. Head on over to the “Settings” tab for the new policy and verify the settings are correct paying attention to the port numbers and network path of the install media. 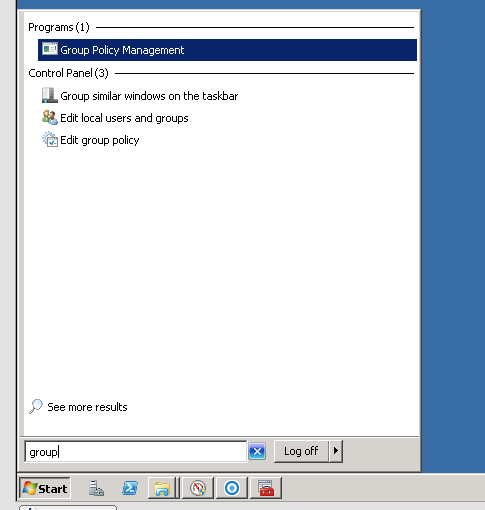 Now we need to force a group policy update and AD replication. 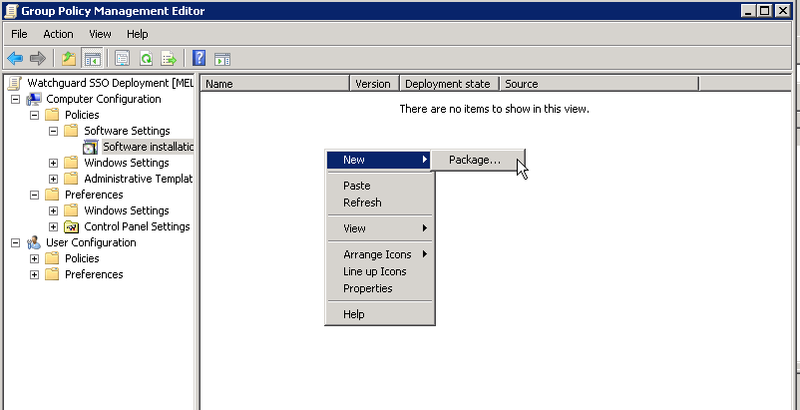 Run the command “GPupdate /Force” to force your GPO’s to be pushed into the SYSVOL policies folder. If asked if logging out or rebooting the computer is okay, just answer no for now. Then force a replication between all your AD controllers by running the command “repadmin /Syncall” this should complete with “SyncAll terminated with no errors” or something along the lines of replication in progress. If you receive any errors or permission denied, ensure you are using an administrative CMD window and FRS/DFS are both running. 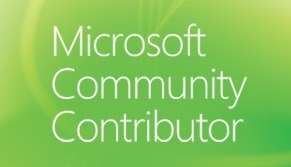 Otherwise refer to an Active Directory specialist. On and end user PC run the “Gpupdate /force” command and reboot when asked to. 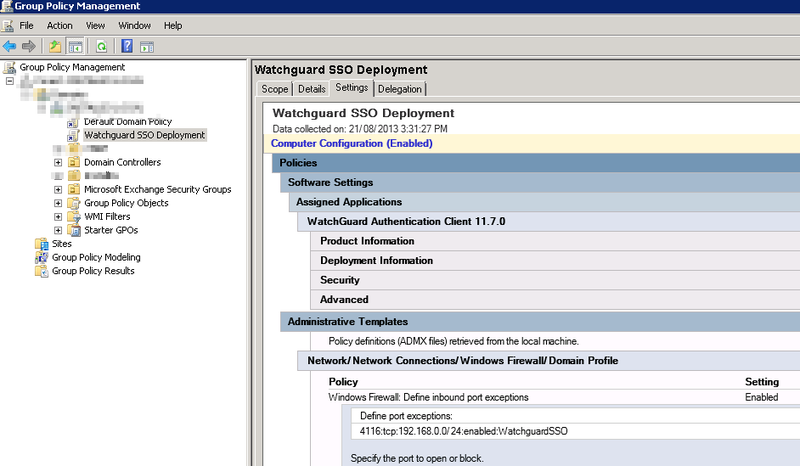 Upon reboot the computer should automatically download and install the WG SSO agent from your network share, Open the firewall ports required and start answering requests. You can check if the agent installed and is running by looking for the “Watchguard” folder in the Program Files folder on the test machine. Note: if you dont run GPupdate /Force on the end user PC’s they will pickup new GPO’s in 90 minutes +/- 30 minutes by default. That’s it for Part 2, so far we have obtained and installed all the relevant software for both the servers and clients. In part 3 we will configure the XTM appliance to make it all come together. you won’t let me delete my comment so I will say never mind, I found the link near the top of the page. Sorry, Jeff. My bad there. I’ve thrown a link in at the bottom for anyone looking for it.